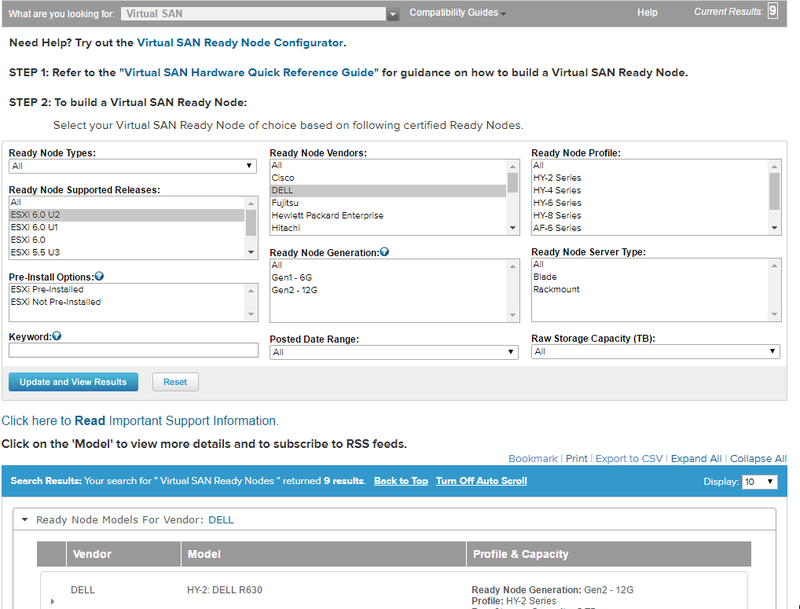 TL;DR : I do recommend you use a VSAN Ready Node if you can. After seeing first hand what @virtualhobbit went through, I was just amazed by how many "gotcha's" are involved with the VSAN HCL, especially if you are trying to deploy this in your homelab. This blog is about VMware gotcha's, so a post was in order. I hope this can help others avoid some of these mistakes. Right. So the idea is you then go tell your server vendor "sell me exactly this". But what if you are looking for a specific hardware device, such as a SSD or Raid Controller? Where would you check the HCL to choose what to buy? "The device PID string (model) is truncated in ESXi. Please use both model number and firmware version when trying to identify the device. When in doubt, please consult with the hardware provider." I'd like to offer a screenshot of this but I don't have one (I found this in the Intel P3700 NVMe drive, which is definitely a PCI device). If you do, please send one, as I'm really curious of why a lspci -v would truncate the PCI registers? certain I/O (RAID) controllers are only supported in a particular mode and have specific VID, DID, SVID and SSID values. certain capacity drives are only supported in a certain disk series. Go find that out. This apart from the driver/firmware requirements you have come to love. Everybody knows NVMe is wicked fast and it's the future - but only a handful of drives are available today on the VSAN HCL. As far as I can tell, they are the Intel drives - HP just happens to sell them too and provide their own firmware release. I'm told Samsung and others are coming. I know the VSAN team is hard at work trying to make this process easier. It's not easy to squeeze all the performance out from the wide variety of devices out there. Add to this the inherent human inefficiencies and costs associated with certifying and supporting all vendor hardware combinations and you can imagine how difficult things can be. My hope is that very cool things that have stemmed from trying to help the VSAN administrators will make it into regular vSphere. I think particularly the VSAN HCL check, part of the included VSAN Health Check, should be easy to port, and a welcome addition for all of us that manage VMware HCLs (which is everybody...). In the meantime, this particular PowerCLI script looks promising as long as we can find the "regular" and corresponding HCL JSON file locations. I wonder if someone has already thought of that and been able to get it to work? It would sure make a nice addition to my documentation templates effort!